Minor loss of gesso carving in upper right corner. 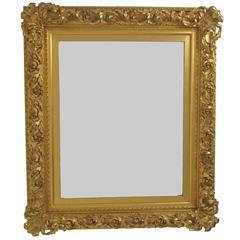 A very fine quality mercury gilded portrait frame now converted to a mirror. Beautiful antique condition. American, late 19th century. A large scale gilt and gesso wood frame mirror, beautiful detail and patina. Can hang horizontal or vertical. 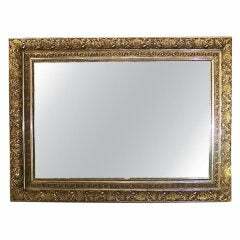 Ornate 19th century French, gilt frame hold a more recent, distressed mirror. Mirror is mottled on back side, no defects in front surface.